Handwriting speaks volumes about an individual, temperament and behaviour. In other words, it is a reflection of one’s personality. In fact, everybody’s handwriting is unique just like one’s fingerprint. There is also so much of science behind it; researchers have come up with a term called graphology, which is indeed the study of handwriting. This is the reason that most of the top private companies prefer to get request letters seeking appointment as handwritten, to determine one’s personality as if you blend with the corporate culture or not. It makes them easy to get sort out the best one from the handwriting experts from the entire lot. Gone are the days when the letters used to be written in hand on post-card, inland letters and on the plain paper and posted in the letter-box by affixing the stamp and sometimes the gum was so poor, it has been fixed by touching it with the tongue. But now with the advanced technology of computer attached with the printer – black and white and colour, the use of the pen is confined to signature only that too when the same has to be presented personally or withdrawing the cash from the bank or post office through a chequebook or withdrawal form. Otherwise, the digital signature is a new technology or with specific mention of the computer-generated statement, no signature required. 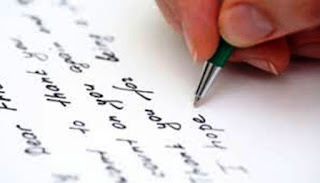 There are a number of factors that may cause to poor handwriting and to improve is to write while sitting at a table rather than while lying on the bed and the best way to improve the handwriting by practising on sand using fingers. While analyzing the handwriting of a person, it is more important to look at the slant of his writing. Among the few tips, if a person writes with the slant on the left, it means that he does not express his emotions well. In the event of lack of slant, it means he thinks with his heart and mind, he uses both emotions and logic to understand a particular situation. At the same time, the people who write with a forward slant, or a right slant, are more caring and emotional. Left-handers are the odd men out who make up about 10 percent of the population. It is said that those who write with left hand are more intelligent and to some extent, it is. Every year on August 13, International Left-Hander’s Day is celebrated. There are also top personalities who were or are the left-hand writer – Five out of the last eight Presidents write with their left-hand – Gerald Ford, Ronald Reagan, George G.W.Bush, Bill Clinton and Barack Obama. Among others are Paula Radcliffe athlete, Pele footballer, Marie Curie scientist, Aristotle philosopher and it is a long list. During my school time, I was very poor in handwriting but it developed when I joined the mechanical diploma course where there were a number of writing the thesis at the end of two years’ session on the green lining called ledger papers and I was judged the best in handwriting. So let it now be everyone’s resolution to write more legible so that you may not miss something important or someone may become the victim of a doctor or lose the job opportunity because of poor handwriting.